SECOND UPDATE: Disney has sent us all six of new high-res images. Click on any of the images below to see our full gallery. UPDATE: Yahoo! Movies has premiered five more images, which are included below the top one in the swamp. Click on any of the three to see Yahoo's fully gallery. With the first Pirates of the Caribbean: On Stranger Tides trailer due to hit theaters next week in front of Tron: Legacy, it's time to crank up the marketing campaign for the sequel that I still can't quite believe actually exists. We got a look at the first teaser poster a few weeks ago, which showed us pretty much nothing, but now USA Today is premiering the first official image from the film, featuring Jack Sparrow and Penelope Cruz's pirate temptress Angelica tramping through the swamp. Reporter Anthony Breznican was on the set to witness it all in action, but beyond some basic plot details didn't come back with much. 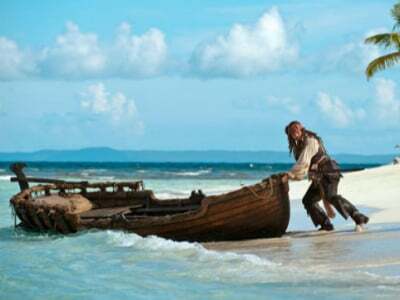 Jack, as we know, is on a mission to find the Fountain of Youth on behalf of King George II (Richard Griffifths), and he's forced to work with Captain Barbossa (Geoffrey Rush) on the mission. 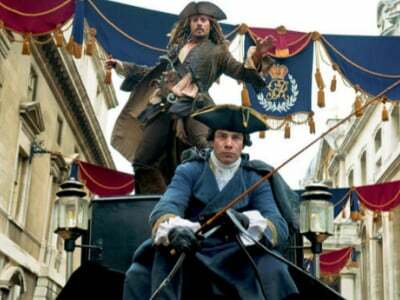 Oh, and don't expect any great epiphanies or character development for Jack Sparrow; as Johnny Depp put it, "Captain Jack is about as fully realized a human as he can be. He's there. He's going to stay there. Which is fine." Take a look at the new image below, and look for the On Stranger Tides trailer to hit the web December 13. The movie opens May 20 next year.